Did Vision Forum revise (“photochopped,” as opposed to Photoshopped) art history to promote their Patriarchal agenda? By Cindy Kunsman, adapted from a post at UnderMuchGrace.com. My elderly neighbors grew up in the Victorian period and had a house full of old, fascinating treasures. Some of the artwork was just beautiful, and as I grew up, those little pieces of the past became a way of celebrating my elderly loved ones who were no longer with me. I must not have been the only one with this interest, for Victoriana Magazine could be easily found — and I thought it was popular, anyway. I loved the Pre-Raphaelite style which depicted women as beautiful, strong, and realistic, along with a spiritual quality and a creative liberty that promoted idealism. They loved to paint themes drawn from medieval history and moralistic myths. When I lived in the Texas Hill Country a decade ago, I displayed framed posters of Edmund Blair Leighton’s two most famed paintings above my limestone fireplace. 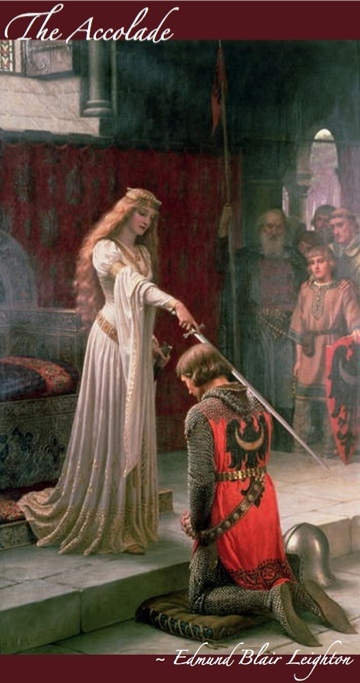 One was entitled “The Accolade,” and I’m told that it depicted Guinevere knighting Sir Lancelot. The word accolade derives from a French phrase of vernacular — literally meaning to embrace someone’s neck. It described the ritual of the touching of a sword to the shoulders of someone as they are knighted. Paired with Leighton’s work, God Speed!, both images kept me mindful of the Holy Spirit as our paraclete, the One who comes along side of us as our helper, particularly when we go off into battle, wrestling against principalities and powers in this life. There is a remarkable reverent quality about both paintings that spoke to me about the power and the holiness of God — and how blessed I was to be a recipient of His unmerited favor. I always thought of the spiritual authority that God bestows upon us, giving us His Name as Believers. We are the children of THE King. I learned that Vision Forum (VF) products appeared right along side Saxon Math books in the Christian Book Distributors (CBD) catalogue. So I went to their website, just out of curiosity, to see just how many VF books they offered there. I put Vision Forum into their search engine online and was immediately drawn to the disturbingly wrong but familiar picture in the sidebar. It’s sad because many people have commented to me that it looks as though Arthur’s Queen is either doing something improper to this young Lancelot or is circumcising or castrating him. If you’re familiar with the original painting, consider that she’s holding a sword. How ironic that they so fear women, yet they “created” this image with their revisionist (art) history! It’s also disturbing imagery because the subjects in the painting look more as though they are the same age, and the book concerns fathers and daughters. So the mental images that this suggests become all the more disturbing. And all because these men cannot bear the thought of a woman holding more authority than a man? How ridiculous! She was Arthur’s Queen! What does that say about medieval marriage? “Mutual Submission with Delegated Authority and Responsibility?” God Forbid!!! Hester at Scarlett Letters has written a commentary about the Vision Forum “product” that featured the photochopped Leighton painting. She reports that the product notes the source but fails to tell everyone that they substantially altered it. 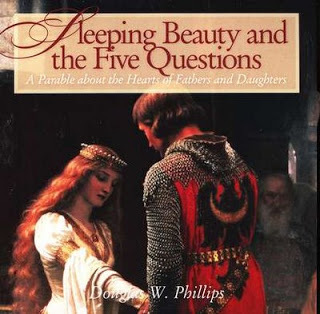 Read more of Hester’s astute explication of Sleeping Beauty and the Five Questions and what it postulated HERE, as well as her comments about the altered painting HERE. Only venture there if you think that you can stomach Vision Forum’s brand of Mormon-Flavored Koolaide. Previous postCrumbling Foundation: How Do We Move on after Doug Phillips and Bill Gothard, our Spiritual Leaders, Have Failed Us? Oh, Serving, I know you didn’t mean to offend. It’s a common misunderstanding and a cultural truism, something that I just happen to know something about, so I used your comment as an excuse to bring it up. We all tend to ally violence with mental illness, but that assumption causes us to be vulnerable to the violence done by the sane people among us. Many professionals tend to view violence as mental sickness and there is some value to that construct, but I tend to the idea that it’s florid forms are from soul sickness rather than mental sickness. (Even though the word “psyche” means soul/spirit, it is not understood that way in psychology.) My opinion isn’t common, of course, and no one really cares lol, but it helps me make sense of people on the borderline, narcissism, socio/psychopath spectrum. They have mental problems, no doubt, but the rampant destruction to others comes through their inability for empathy, as you correctly assess. Yah, so the reason to try to dramatize insanity via Hannibal Lector rather than Daffy Duck is that Daffy Duck is about the chaos of silliness not the chaos of insanity. Hannibal Lector presents as a man without qualms, which is chaos too, but of his own initiation rather than as a recipient of a freaked-out brain. So he doesn’t make a good model, either, but better than Daffy. None of the people I met in-hospital were like Hannibal Lector. He is the caricature of the soulless man, no rules but those he chooses, and driven by a need to avoid boredom. Boredom is a terrible thing for him because he cannot find relationship with anything in reality. Thus all is empty except that which he initiates. This is textbook socio/psychopathy. Heath Ledger’s Joker was amazing and he presented a person who was both sociopathic and schizophrenic—a very rare combo. What made his Joker impossible was that he was not only schizophrenic and sociopathic, but was also socially functional until he blew apart with everything around him. But super-heroes need super-villains. Yes, lack of empathy is what Hester’s friend was sensing. The lack exists on a continuum—we all struggle with it sometimes, but when it becomes that extreme, short of Hannibal but on the same end of the spectrum, people do indeed become frightening. To recognize it is good reality testing, really. I’m glad Hester’s friend brought it up, but for caution not fear. It is either love or fear that constrains us. Love casts out fear. I think this is why Jesus said all law hangs on love. I didn’t clarify what I meant well enough in the use of the term “academics” within the Christian set. I should have specified that I meant those who are involved with the counter-cult effort who designate themselves as the go to folks for Christians after they get out of a high demand/aberrant/cultic Christian group. Unless you are a minister and are in the club, the group of Christian apologists will not really accept you. If you are one of those who is involved with the secular response to these groups, you’re held at arm’s length. (On the other hand, as a non-minister, at the first sign of conflict, they ran me out on a rail). Men also fare better than women. Before I gave my last presentation with such a group, I gave the president of that group a run down on items that might be potentially inflammatory. I told him that I was going to talk about Lifton’s thought reform criteria (among a list of other things that they now deny that I ever discussed with them). This man’s first response was “Well, we love Paul Martin.” The now late Martin was a clinical psychologist who opened the first accredited inpatient program for people in recovery from cultic groups and abusive relationships. I saw that Don Veinot made a favorable reference to Bob and Judy Pardon at Meadowhaven (with whom I’m working on a big project for ICSA) in his recent newsletter. But Bob is an Anglican minister who runs a residential recovery facility. If you read the reference in Veinot’s email, he sounds uncomfortable, but mentions Meadowhaven anyway — as if he’s not yet quite comfortable with them. The bottom line is that the apologists feel like if they admit that sound doctrine is not a perfect and impervious guard against getting sucked into a high demand group, it’s like admitting the Bible is inadequate and godless (secular) psychology is better. Yet 90% of the Scriptures in the canon that speak to spiritual abuse say nothing about doctrine. But these guys are only really comfortable with that 10% zone. They seem to miss the fact that Jesus was the most astute psychologist that ever lived and spoke about human behavior very often. So it’s the academics on the front lines as first responders to the trauma of bad religion are the ones that I meant when I made that comment. An importatnt aspect of the adaptation of the Leighton painting is whether or not Vision Forum secured the rights to adapt and use the image for commercial purposes from the copyright holders. I would be very surprised if the owners of the image would allow this crude adaptation. Did anyone look into this? In the US: Under the rule in Bridgeman Art Library v. Corel Corporation, a mere ‘record’ photograph of a 2D work of art (i.e. a photograph which is an as-accurate-as-possible copy of the original) acquires no copyright protection. This applies to “faithful reproductions” of the work, however. Cindy, This is it. I remember when I first saw that on your site years ago and clicked through to what Paul Martin was communicating. I did my own homework and boy did scripture read differently after that. Lets face it, if they had been treating each other right, there would have never been a need for the Law. The Law was for Lawbreakers. I often wonder if they have ever read that demons believe “right” doctrine, too. The “right” doctrine is communicated by who we are now. I use yahoo mail, so after I log on, then I go to “settings” and then “filters”. From there, you click add, then create a folder name. After that, you need to set criteria, such as mine is “Sender Contains” Spiritual Sounding Board, and “Subject contains” New Post. Then save that, then make another one, where sender contains Spiritual Sounding Board, and subject contains New Comment. Sometimes…not often, but sometimes…Yahoo will not transfer it to the appropriate folder, so it winds up in regular inbox. But again, that doesn’t happen often. I just transfer it there manually, when that happens. I did that due to my inbox becoming overloaded. I am not always able to comment, due to work, and before you know it, one new post creates several hundred comments in a day or two. Then I get so far behind. I really need to spend some time looking up what the issue is with Word Press and iPads. Someone told me it made a difference when I changed to comments so all of them are not on one page (on a post with many comments). A friend of mine also mentioned the issue with me recently, so maybe that isn’t the fix. Hmm. Huh, that’s fascinating, Cindy K. Thanks. I have not run inside these circles, am only a reader/watcher from the (former) edges of trad Calvinism. You have to squish into a box in order to address it. I am sorry about that; your mind is much bigger than the box and it would be lovely to be able to use it freely. I do not envy you your task, dear lady. How do they view Boz, then? How carefully he continually quotes scripture! So as I see it, evangelical ideologues violate the Bible, turning it into what they want it to be, “the complete and whole truth on God&universe as we see it”, meaning just big enough for them to understand and control, and then slap it with the label “God His very own self”. Hone in on that 10% and then extrapolate extrapolate extrapolate. The sad truth is that ideologues cannot dismantle the cults that will always form at the extreme ends of their ideology, because they’ve chopped the world down to controllable size and solutions inevitably rest on the other side of that line. That’s the nature of such ridiculousness, whether in the godless USSR, as HUG continually points out, or in US evangelicalism. Ach! I have wondered about that myself. I have a theory. Boz keeps it “in house” with investigations and trying to “reorganize” the institution so to speak and they walk away with a seal of approval they have “cleaned up”. (Not seen any make it to that point?). I think that is uncomfortable but not unacceptable to them and he is easily ignored. Personally, I wish he was prosecuting them instead. I am not sold on “inhouse investigations” at this point. So none have actually made it to the endpoint with his group? I’ve found that if I tap the X in the address bar, immediately when a full screen pops up and before it changes to a refresh arrow. I can load comments above 50 or so. If I’m a second slow, it’s gone– sometimes along with any other tabs. I went to the site a while ago looking and could find none. No far, 2 orgs discharged them (ABWE and BJU) but then with publicity, BJU backed down. I have a hard time understanding how an organization would pay someone to be investigated and it be totally open and transparent. And if part of the investigation is some agreement to restructure but also silence not sure that is nothing but sweeping it under the rug with a plastic fish on top. I have no reason to believe Boz has anything but good intentions. Let’s just say I am cautious and uneasy about how it is structured and implemented. What is the endgame? I found the email from my better half addressing the iPad WordPress issue, and this worked for him. (He was a brand new iPad user at the time, and though he never reads blogs, he set out to help a friend of mine who couldn’t follow here on her iPad. He’s such a good guy that way.) This doesn’t address why wordpress and iPads don’t interface well, but it seems to provide a way around the problem. At the risk of being wrong, I think that I have found a way to read WordPress blogs on an iPad. In settings change image quality to Medium (default is High). Wordpress blogs should now be readable. I’m glad to see that GRACE is also involved with raising awareness about child sexual abuse. It seems Happymom was very encouraged by the conference. Thank you!! I was able to open that “Queen Bees” post w/o any problems. Normally it would have crashed on me. Here is my take on GRACE and my impression of the apologetics world. They both seem to be on different missions, and I don’t think that they see yet how their missions overlap. I’ve tried to engage GRACE regarding participation with ICSA (the secular approach to how to help people post-damaging religion/politics/extremism through education and research). GRACE will not even acknowledge that they’ve received my inquiries. My husband says that it is attorney run, and this sounds just like the response of an attorney. The other issue that I suspect is true with them is that they are overworked. Everyone there has a day job, and this ministry takes up all of their expendable time. I don’t know that I’d want to be married to one of these volunteers. It’s demanding work, especially when they’re in the thick of the interviews and the verification work that they do to validate the truthfulness of the testimonies. I get the impression that the counter cult movement sees themselves as the academic experts in how to relate to aberrant religion, but they really do only want to look at doctrine. Not all but certainly the people who are in charge of the system seem to be a bit proprietary about it. And take with a grain of salt that my perspective is skewed somewhat because of how I was blackballed because I was falsely accused of calling Bruce Ware a heretic, so the SBC made sure that I would never again have a voice in this genre of apologetics. They may end up teaming up with GRACE at some point or may start making referrals to GRACE, but I believe that they see their missions as very different. Until counter cult apologetics faces the fact that most high demand religion’s power comes through socialization and deception and crafty twisting of how people think over time, they’re not going to be too interested in GRACE. And I would love to see unfolding history prove me wrong. Another consideration: The counter cult apologetics biz is largely supported by the SBC (drawing most of their money and free facility space for meetings from them), and GRACE has dealt with groups outside of the SBC at this point in they short history. I don’t wish to offend any Baptists here, but there is a mindset that Baptists are the true blue Christians, and those outside of that are seen as not quite as good. And the SBC tends to avoid discussing the IFB because of that bad history and not wanting to seem like they’re attacking them. And the Christian and Missionary Alliance group– well, they’re pentecostal, so there’s another strike against the appeal that GRACE might have for apologetics. Again, consider that I’m looking at this from a position of having been largely ostracized from the discussions within apologetics at this point, though much of what I’ve said here has come out of the mouths of important people of note who are still in these groups. They’d never corroborate, however. They denied me the opportunity to prove every jot and tittle of what I said and my bibliography was something like four pages long which I handed out to everyone and is still on the internet. Well in advance of the conference, I offered to drop the names of the SBC men (not VF people) who made some of the worst statements, but I made this offer over the phone. The Pres said that if I could defend it, keep it in. The SBC got so angry that they had the group insult my scholarship, they disavowed me and my work, and then they said that they “didn’t have time” to review my evidence because they had other demands on their time concerning the emergent church. All the things that were said to me on the phone and all of the things I offered to drop were denied. Then, they sent personal communications of mine to all sorts of people to make me out to be some kind of witch because I’ve studied hypnosis for pain management (as a nurse who deals with pain management) and also investigated it’s applicability as an aid to people in PTSD. I will never communicate with these Christian folks apart from email now. No telephone unless it’s being taped. Never again. Patrice, the other stuff touches on epistemology along the lines of why Gordon Clark got into it with Cornelius Van Til. There are too many foundationalists who are afraid of psychology and can only see it as sinful atheism. I’m a coherentist who is more like Van Til who believes that the material world and the spiritual world or the abstract world of principle are not in competition with each other. Truth is truth in any realm, though I may not have the ability to quantify or qualify it, but I can gather data about it and put those truths to the test. As “Another Tom” who comments here puts it, “All truth is God’s truth.” But because of the anti-psychology bias among Evangelicals, the lot of them seem to get really threatened. I don’t know why they don’t see Jesus as the wisest psychologist ever, preceded by folks like Solomon and many other sage prophets who understanded the corruption of the human heart. I think that Calvin did, too. I don’t compartmentalize truth and am a coherentist (more like Van Til — and Rushdoony for that matter). I don’t always speak the same language as the foundationalists (those who are more like Clark). So there is some of this going on in this world, too. I can expound more upon that or can find some old blog posts that do, too, if you like. Doug was one big fraud & still is. You can’t/couldn’t believe anything he said. He exaggerated, lied, manipulated and stretched truth in EVERY single thing. EVERY thing. So this is just one of hundreds of issues. One thing we can always say for SBC leadership is that they are childish, and not in the way Christ meant. “Hypnosis = Witch”, the declaration of a 9 yr-old who’s watching the news after finishing a Hans Christian Anderson compendium. Perhaps childishness is a fundamental qualifier in their job descriptions; you know, just above the academic credentials listing and just below the “Are you a male” check box. But they way they ganged up to insult you and your scholarship, spreading gossip and using the phone (no traces! ), well, that’s just girly tactics. Tsk tsk boys! I’m glad you have a loving mature husband. The Clark-van Til debate—that brought up faint memories from undergrad studies at Dordt College (the “not Calvin College” Christian Reformed institution of higher learning lol). I’ll refresh myself today on that one, although I remember rolling my eyes over it back then. I like the term “coherentist”. IMO, this is the main value offered by the Reformed tradition. It is not only van Til who is such, they all take coherency seriously. Their theologies and philosophies hang together while taking into account all that is known; and there are several iterations of them. It is why they are good at building colleges, such as Calvin and Hope, schools with influence much broader than the size of their denominations. I’m fairly certain it is what initially attracted the hyper-Cals, but never having learned the joys of logic, they simply grabbed the most florid (and weakest) parts and ran. It is also why the immature among them think they can get all snobbish about “how the rest of you believe”. (Looking at you, Kevin De Young, who have no excuse) It’s ridiculous, of course, but well, childishness is everywhere! FWIW, my best friend is a relative of van Til. The family is a hard and critical bunch. My friend has still not freed herself from the strange contortions of total depravity and workaholism-is-godly themes, more highly valued by them than in other Reformed circles. His theology causes damage. Also FWIW, I hang most with the coherency of Dooyeweerdian thought (a philosophy, not a theology), which comes out of Kuypers, as does van Til, but with some fundamental differences. Lol. How silly! I’m an artist not an academic, having merely spent some enjoyable evenings poking through the stuff. And it is “poking”—I never read completely because I get impatient, whereas I have immense patience for art making. Thanks for writing it out, Cindy. I know you are busy this week. You are very good indeed. FWIW, since some advanced topics have popped up here and we’re talking intellectual infrastructures and systems, I’ll note that I did the van Til-Warfield-Dooyeweerd thing myself almost 40 years ago. So, I get it about the overall appeal, but see what can happen when one takes their results as primary instead of secondary, and then promote the form rather than the underlying thinking substance. Oddly, it’s own form of pre-gnostic idolatry, the worship of information and/or membership by intellect where only smart people count. Some of the “C” words I used for developing my own theory of paradigm systems include COMPREHENSIVE (encompassing all “semantic domains” and academic disciplines), CONNECTED (holds together as a system instead of being utterly dissected and the parts merely create a mosaic of pieces), COHERENT (it makes sense, even if it uses some logic approaches that are beyond the usual western analytical logic), and CONTEXTUAL (keeps the entity in its normal environmental setting rather than studied solely in isolation and thereby making the analysis into an artificial item). You need all four of those, integrated, to capture the fifth “C” – COMPLEXITY. That is, I think, where a lot of the wannabee theologies/philosophies fail epically. Their superficial hermeneutics and study techniques, lists of “best practices” tips, passing on of inerrant theology without any critical thinking/discernment skills … those kinds of things … mean all they really have is the contours. They maybe have the shape of what God intended to impart in His revelation, but have lost all the richness inside the shell. Empty. Vanity. Form of godliness but denying the power thereof. Bringing it back to the overall topic of Vision Forum and related approaches, I think all of us have a desire to explore and understand our surroundings and how things work – nature, personhood, community, the cosmos. It’s part of our spiritual DNA of being made by the Triune God in His image. But exploration involves a lot of hard work, so when someone like Doug Phillips or Bill Gothard comes along with an easy-squeezy formula that puts all of life into perspective for you, it’s tempting … this possibility for relief from the toil and task of creativity. So, how easily we can succumb to swallowing a set of someone else’s perfectly crafted answers than pursue our own creative engagement of questions we generate about the world God put us in … and then become hard and harsh when others fail to swallow the same system. Patrice, I remember when Cindy went through this as we were communicating then. What some of the SBC seminary big names said about her is inconceivable from “Christian” men who make their living off Jesus. The goal was to totally marginalize her even with the secular media. You gotta have big boy britches and the full armor to go public disagreeing with them. That is why so few tell their stories. People are ruined enough and fear having reputations damaged for life. And in those circles, that is how it works. There was a former faculty person at SBTS who allowed another blogger to go public around 2007 about Al Mohler’s tirades and tyranny of staffers. I have a family friend who worked for him and already knew that. But no one DARED mention it or they were gone. It is a totally closed system. The former faculty person was anonymous but it was SO TRUE and everyone knew it that Mohler had to issue a public apology to staff at SBTS. And that is supposed to be all it takes. An apology. He does not have to grow up or change. His fans are satisfied. He can be their king again. My friend who worked there had NO idea it was that bad when he went there. He already had an MBA and had worked in corporate American for a long time before he decided to uproot his family and get a PhD there. He was shocked, stunned and felt like he had been mislead about all the praise for SBTS. He got the PhD and got out as quickly as possible. But his outside secular education got him a pretty high position while he was there. First thing he was asked by other staffers he worked with? Are you a Calvinist? Since he wasn’t and was honest, his time there was grueling and a horror. Patrice, I saw this last night and thought of you. He describes the Kingdom on earth as working for Justice and Beauty. He talks about the place of art in the Kingdom. I think you will enjoy it. I use yahoo too, so that worked out well. I will try it out! This is all so awful. Though I’m not too surprised after hearing how the SBC has treated Amy Smith. Yes, but it is not the doing itself that is the problem, but what we think of ourselves and of what we are doing while doing it. Christians need to treat every human endeavor as he speaks of justice/mercy. Whether academics or individual reading of the Bible with prayer, whether painting canvasses or houses, whether self-employed computer programmer or a car mechanic, we don’t get things perfect but we keep at it because the good that is in it will be made complete by God (in His/Her time). What keeps us from idolatry: understanding that all we do is an offering to God, knowing it is also from Him/Her, as also are we ourselves. And too, that we understand our small work to be one note in a symphony, as NT Wright says about the stone masons at Durham Cathedral. Idolatry occurs in every area, wherever/whenever we think we’ve got it “just right” or that we’ve become essential to the endeavor or that our field is better than all the others. At the point we become willing to be deceitful “on behalf of the greater good”, we have begun to turn aside. When we entertain the idea that our “product” has reached the apex of truth, we have turned. Same thing happens when we stop openly listening to criticism (I don’t mean tearing-down but genuine evaluation which we will welcome when properly situated to our work). You have thrown yourself into your work and I’m very glad of it, Brad. It’s valuable and solid. A last bit: we need to keep a sense of humor about ourselves. It helps us keep an accurate perspective: it’s God’s serious work done by our very small hands. The more serious the work, the lighter we should hold ourselves. It is the only way to get through intact. Lydia, that vid was lovely, I cried. Thanks so much! Lydia, Cindy K, I cannot imagine what it was like to have been through what you two have in confrontation. I really can’t, because I was too dissociated when inside the church, and since then have been gone from it. I hope very much that what these people (including all who JA and TWW write about) say privately in their future shenanigans, will be carefully recorded, recounted, and publicized. It is important to no longer stay silent about it. They count on the fact that what is hidden didn’t happen, as if God isn’t listening when it’s one on one. They count on the fact that what is hidden didn’t happen, as if God isn’t listening when it’s one on one. Just the opposite of German Bureaucratic Tradition where you CYAed by Documenting Everything instead of Denying Everything. It’s the reason Hitler’s atrocities are so well-known while Stalin (who racked up two-three times the body count among his own people and whose dictatorship directly inspired Orwell’s 1984) got a free pass. I know, me too. He has such a way of painting word pictures. “Correct Doctrine” = “Purity of Ideology” in Marxspeak. Since the French Revolution is long out of living memory, ask any survivor of Cambodia’s Killing Fields about how far “Purity of Ideology” can go. The betrayal by the apologetics set is ancient history, and I feel like God did me a favor in a way. I learned quickly who I could trust, and it all continues to help me learn better boundaries and then to defend them. You would have loved it, though. They day they tried to talk me into taking the video of that 2008 workshop offline (“we have to be ‘pastoral’ and lose this battle so we can win the war”), my husband called their mouthpiece on the phone and called them all cowardly and him cowardly. Lydia, any kind of art is a plain blessing. It’s a need/desire in us, gifted or not, to engage the world in open physical ways, whether dancing in the bedroom or tangoing with a partner, singing while showering or in choirs or as solos, playing sax in the woods, taking photos on a hike, acting a part on stage, creating a garden, carving out a piece of wood, taking pencil and paper to try to capture the sleeping face of a loved one. The options are wide enough to capture everyone somehow. I did coloring books first, followed by paint-by-number, and I adored them. It reminds us that we are also made of stuff and we are not our full selves unless we are also stuff; and one day, we will get new bodies, and we will always ever be able to glory in the materiality of the world. I wish it for everyone any way that works. We tend to think it’s only worth doing when it ends up good enough to be seen/heard, but fundamentally, the meaning of it lies in the doing. So please, dear Lydia, don’t let your mom’s abilities get in your way: sing and paint-by-number all you want. You and God are talking and that always makes a good conversation. The short version of this epistemology stuff. People tend to have styles of how they put truth into perspective — how they deem truth as true. Each style (like each personality) tends to have strong points and weaknesses. It all depends on what makes sense to you and how you grasp things. One is not better than the other. They are just different. The foundationalist prefers axiomatic truth, and they take basic concepts that they identify as incontrovertible and incorrigible truth, and they make those truths the basis of everything else that they understand. These ideas become like foundation stones in a house. This works well if people have a good process of vetting truths that they identify as foundational, but one of the weaknesses of this style is that it becomes hard to challenge those truths once they’ve been assigned. How do you repair or remove the foundation stone of a home or a skyscraper? People have little incentive to do it. What if their understanding of a basic concept was flawed, or they were deceived, or didn’t have all the facts? That’s the weakness in that style. Truth can be taken for granted. The coherentist tests truth, trusting that truth is true in both the realm of abstract axioms and in the material world. True that is tested will float like a log on the water. Rather than building a house, the coherentist builds their understanding of what is real like one would build a raft. Truth can take anything that you throw at it, as truth will always float. If an idea starts “taking on water” and is no longer buoyant (perhaps by false belief/deception/not enough info), it can be cut away. Truth is constantly being put to the test, or at least it should be. Clark was a foundationalist, but he was not very fair and balanced. He accused Van Til, the coherentist, of selling out truth (and Christianity) to facts from the material world. And neither man handled the natural tension of difference very well (neither right nor wrong if the person is balanced and honors Scripture). They handled the conflict even more poorly. It wasn’t an issue of error but an issue of style. My favorite example of an extreme foundationalist who is very much out of balance is the KJV only type who is afraid of everything and would rather let their toilet overflow than have an atheist plumber come to work on their septic system. Somehow, their atheism will interfere with their ability to understand plumbing…. An out of balance coherentist gets driven around and becomes inconsistent. They tend to agree with everyone about everything, and truth loses meaning. Lydia, I really, really like NT Write. That was excellent. Thanks for posting the video. Your whole comment was so great, Patrice. I need to do a better job of telling you all how important your role collectively is here.There are many who have contacted me privately telling them how much they have learned from the conversations here and are making proactive changes in their life to get out of bad/abusive churches/religious environments. There are many more who read than contribute and God is doing a great work here through you. Thank you all for being an instrument in the larger symphony. JA, oh I’m glad. I too find it helpful to be among the people here, every one of us contributing a bit, clarifying/expanding our understanding as we go. Even the cranky ones who come storming in from the outside are helpful. And when those who read these conversations find in them new tools/ideas/comfort for their own paths, that is a fat cherry on top. Which is what you intended when you set up your online living room. How lovely that it’s working! I know, it really touched me in a significant way. And with me these days, I can barely stand any ‘celebrity” Christians. I am so suspicious of them. So I cannot vouch for his personal character but the difference with him is that he understands what is going on in American Evangelicalism. If you listen to him enough he mentions it a lot. He is first and foremost an ancient scholar. But he is able to communicate historical context in an understandable way. He is more of a scholar/teacher type. And he did not really start publishing until 40’s. He was not some wanna be celeb. Truth be told, early on I had to get past the big cross on his chest. :o) I never in a million years thought I would be listening to an Anglican Bishop. But I got out of the evangelical ghetto. That is it. I may not frame it or hang it but what did I experience/learn in attempting to create beauty? I also was not gifted with a beautiful voice even though from a very musical family but could do harmony to sing at church and other places with my mom playing. My daughter was gifted with a beautiful soprano voice and she loves music/singing. I can see her experiencing beauty in another way when she is singing. I encourage it but don’t push hard with it. I want her to keep on “enjoying” it. Yeah, generally before your start a performance, you only think of what you might do wrong, but when you finally get started, you fall into the music and that is where you stay. True also for most actors and dancers. And whether they are good or awful at it. For some odd reason, that transition is surprising every time. Lucky daughter to have a beautiful voice! Cool that you could hear her, too. Does there seem a continuity with your mother’s music? I am blessed to have a daughter with my mom’s personality which is opposite of mine. She loves people, nature, art, music and is an extroverted bohemian in a simple headband and jeans way. The opposite of me as I am more introverted, corporate and task oriented. Such a blessing since my mom died 4 years after she was born. A beautiful reminder of a lovely woman. Blessings come in unexpected ways. You’ve made clear how much you enjoyed your mother’s approach, so I’m glad it still weaves through your life.